If I was any good, I would have been watching the Rugby yesterday afternoon. I love a bit of International Rugby but, for whatever reason, I wasn’t in the mood yesterday. Then there was the boys, who had commandeered the computer for a few hours, preventing me from getting at the writing stuff I needed to do. So I put the telly on and pottered about the house with it going in the background. RTE were showing a Poirot, one of the ITV David Suchet ones. Typical Saturday afternoon fare – those older hour-long episodes – I wasn’t into it. But then I noticed the setting, the opulent train carriages, the locomotive snowbound in the Balkans, and I quickly became interested. This wasn’t just another ancient repeat, this was a 2010, brand-spanking-new remake of a story that had meant quite-a-bit to me when I was younger. This was Agatha Christie’s ‘Murder on the Orient Express’. Before I tell you a little bit about my relationship with that book, back in the dim and distant past, let me hit you with an impromptu review of the version I saw yesterday. I thought it was sublime. Far and away the best adaptation of this book, in my opinion and, at the centre of it all, sits David Suchet – an ageing, troubled Poirot, weighed down by the burden upon him, introspective and, at times, wonderfully still. It’s a difficult story to make work – there’s lots of characters and the setting is as closed as closed can be. Plus, it suffers from the same problem as Anthony Shaffer’s ‘Sleuth’ namely; who in the world does not know the famous solution by now? Don’t worry, if you’re the one who doesn’t know, I won’t be the one telling you. You are quite safe here. How typical of RTE to place one of ITV’s biggest productions of the current year on the telly at three in the afternoon. Still, if they hadn’t, I wouldn’t have seen it so thanks guys. If you get a chance to see it, please do. The script adds some stuff to the original story, particularly at the end, but the iconography and moral grappling which this introduces is well worth the revisionism. 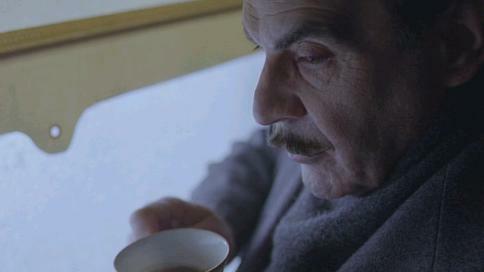 And, hey, once again, David Suchet is simply marvellous in it. So why does it mean something to me, this rather silly story of murder in the Balkans? I’ve referred to it before, in other posts, but, when I was eleven-or-so, my best mate’s dad was the station master and he used to take his son to Dublin on the train for free to see all the new movie releases in the cinema. In 1974, one of the big movies was the adaptation of ‘Murder on the Orient Express.' starring Albert Finney. Hard to believe, I know, but it really was. There was an impressive advertising campaign before the film came out, which was quite unusual in those days, there was a rather stellar cast and the premise looked exciting. So, when Martin headed off to see it in Dublin, and it was still several months from arriving in Sligo, I took my extremely limited revenge by buying the book and reading it. Martin returned from Dublin pronouncing it to the best thing he had ever seen, with the most extraordinary solution. He chatted to me every day as I read the book, asking my opinion on the various characters, the scenarios and such. The effect was very much like I was on the train solving the mystery for myself. In the end, I failed to solve it and I was as stunned and impressed with the book as Martin had been with the film. Bear in mind that I was only eleven years old. When the film finally arrived, I was extremely disappointed with it, although the music was good. So, the reading of this book marked a few important ‘firsts’ for me. It was my introduction to Agatha Christie and the birth of a drive in me to create some of my very own mystery stories. It was also a revelation to see how much more satisfying a book can be than the resulting film. But perhaps more importantly, it provided me with a taster for social media. Nowadays, if I want to talk about a movie or a book, I can do it anytime, here in the Internet. Back then, though, to find a common point of discussion like that was both exciting and intriguing. It planted a seed, I reckon. …’see what I did there? I think I must have seen just about every adaptation of every Poirot story written by Christie and most more than once. Like Jeremy Brett’s Holmes I really can’t imagine anyone topping Suchet as Poirot but one should never say never I suppose. I’m sure there would be those out there who could never imagine anyone better as Holmes than Peter Cushing. Our cockatiel is called Poirot. He never gets called anything other than ‘Birdy’ but his name is Poirot and he has much in common with the often-curmudgeonly Belgian apart from looks. You can find a fine photo of him here. I tend to view the TV dramatisations of the likes of Poirot and Marple as comfort food. I never seriously try to solve the plot and, to be honest, apart from Murder on the Orient Express I can never remember whodunit anyway. But even when I can I don’t worry. No one goes to see Shakespeare’s Romeo and Juliet to see if they manage to survive this time. If anything it’s better to see a Poirot more than once because you can start to appreciate the performance without obsessing over the story – we know he’s going to solve it in the end. I think part of the problem with Suchet is that we are so used to the excellence of his interpretation that we have come to take him for granted a wee bit. Hi Jim. That last point, that we are used to Suchet in the part, is probably proven by me. I haven't seen all that much of him in the part and then I was knocked-out by his astonishing performance. So you're right, as usual. I wonder if Suchet has done 'Curtain - Poirot's Final Case' yet? (Off to look that up) I'd like to see that.